Hi All! 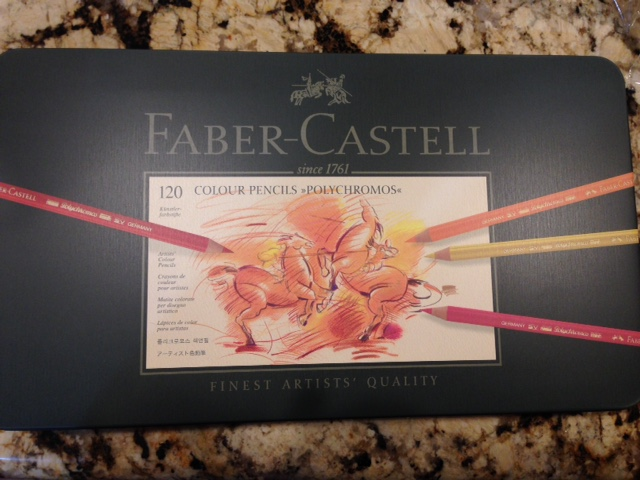 Recently as a gift I was provided with an amazing set of Faber Castell Polychromos pencils. I was really grateful for it I decided to share it with all of you. 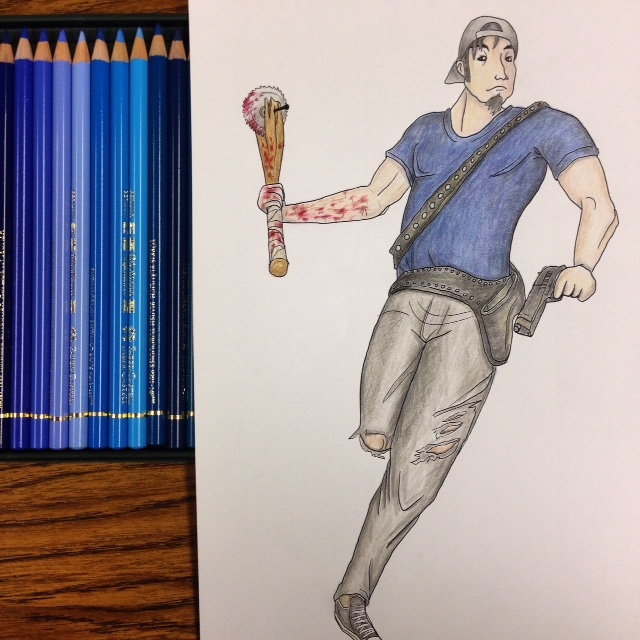 Adult coloring has been very popular recently. 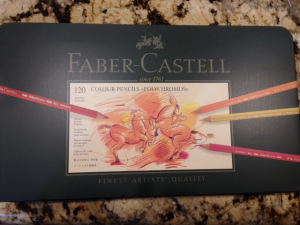 I know many people have used these pencils, but I wanted to let you know about them before you decide to purchase them. They are a medium-soft color pencil made in Germany. As you can see they come in this very nice tin case. 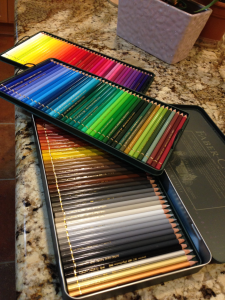 Lucky me I was given all 120 colors they have to offer. When you open it up it comes with three tins with 40 pencils each. The best part is that for the most part they are already in the order you’re going to want them. Each pencil has it’s name color name in English and German, the color number, the color fastness marked with *, as well as the brand name and where it was made. 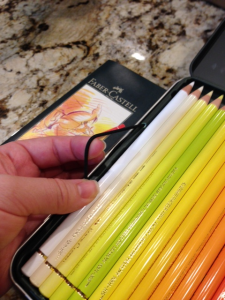 Unlike other colored pencil’s in tins this brand had a couple of nice features to include. On the underside of each plastic pencil holder is padding so that the pencils underneath are well protected. Another useful feature is that each plastic holder has a loop for you to lift them out of the tin. They are an excellent pencil that allowed me to a wide variety of techniques. I’m in no way a professional artist, but I was able to create textures and smooth transitions of color. They blended nicely together. Being an oil based pencil it was nice that the color wouldn’t hide the lines in what I was coloring. Sometimes when using wax based pencils I would have to go back over the line with a marker to darken up what I just colored over. I have three concerns about this set. One is the price, it is a huge investment and I highly recommend you find the best deal you can. While it is a great set, it may not be something that is in your budget. While the words are written in a beautiful gold paint, the name of the product can be hard to read because of the reflection. The biggest concern I have is that the case doesn’t stay shut when it is in my travel bag. Unlike other pencils in a tin case I often find that it has opened spilling all of my pencils. If you do decide to get this set, I recommend you get a pencil case of some sort to store them in. Otherwise it’s a wonderful set and I highly recommend them no matter who you are. For more coloring examples check out my Instagram page @craft_and_colors; until next time, have fun creating wonderful pieces of art! Hi I'm an amateur colorist that orginally started because someone said it would be a nice way to relax (and it is!). I mostly use color pencils, but have dabbled in watercolor. 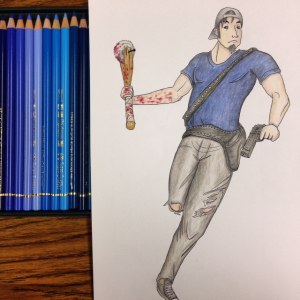 I'm horrible at drawing and get my creative needs by coloring. Check out my website for some examples of what I've done.